Full-featured and compact benchtop dispensing robot offering accurate and repeatable dispense results! A benchtop system does not equate to "no features". The Catalina Series benchtop systems are compact, full-featured platforms with these standard features: automatic vision, laser surface sensing, and nozzle alignment. Our tabletop dispensing robot provides you with accurate and repeatable dispense results. Catalina Series can be configured with an optional heated work area. 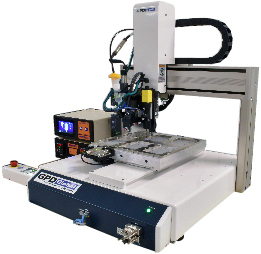 Applications using solder pastes, glues, encapsulants, gasketing, underfills, conductive adhesives, and more benefit from a Catalina Series tabletop dispensing system. Easy to learn, computer-based software with Windows operating system. Easy to use point-based teaching for all axis movement. Able to set point jobs and various parameters. Automatic alignment and positioning with high resolution camera. Create dispense paths using camera teach or on-screen graphic editing. Import DXF files for complex path programming. I/O ports provide the flexibility to add advanced features/equipment. High repeatability with contact probe or non-contact laser surface sensing. Dispense with Tilt and Rotate function. System automatically locates alignment points to account for product shift and rotation. Laser traces the dispense path and measures surface variation, then adapts height of the dispense tip to maintain a consistent gap. Vision system locates alignment points to account for product rotation. Locates dispense tip in X, Y, Z for accurate fluid placement. User-friendly graphic editing to create a dispense path. AutoCAD DXF files are supported. Easily duplicate a common pattern in a matrix. Multiple types of fill area and dispense patterns. Easy to teach. Fluid Pressure Control (FPC) - Real time process control for pump. Constantly monitors and adjusts fluid pressure entering the pump to maintain optimal pump operation condition. Heated Work Area - For heating substrates up to 120° C (248° F). Fluid Level Detect - Notifies operator when fluid level attains set point. Contact Surface Sensor - Alternative to laser surface sensor. A contact probe may be used to physically touch a product in order to locate the surface. Laptop Computer - Runs the software. Teaching Pendant - Remotely controls tabletop robot. High viscosity pastes, glues, adhesives. Simple liquid dispense applications, low-to-mid viscosity..
Fluid Pressure Control (FPC) for use with Precision Auger Pump and Jetting Pump (NCM5000) pumps, as well as Time Pressure Dispensing. Programming Method and Teaching Easy point-based teaching for all axis movement. Able to set point jobs and various parameters. PC Teach / Graphic Edit Easy point-based teaching for all axis movement. Able to set point jobs and various parameters.